Yesterday afternoon I enjoyed going to the York Clandestine Cake Club‘s event which was kindly sponsored by Yorkshire Tea. It was held at Rachel’s house who is the organiser for the York CCC. We had a lovely afternoon, lots of thirst quenching Yorkshire Tea alongside delicious Yorkshire themed cakes. I had been wondering what to bake for this event ever since I’d signed up for it. I wanted to bake something that represented Yorkshire and the food that is produced in our wonderful county. I had thought about using my Yorkshire Rose design on a sponge cake that I’d used on a wedding cake last year and for cupcake toppers but I just didn’t have the time. I eventually settled upon baking a teapot shaped cake using two cakes baked in a special spherical tin I had bought in Lakeland last year. The idea came from one of Fiona Cairns’ recipe books where she features a recipe for a lemon flavoured teapot cake with white flowers on top of pale blue sugarpaste. However, this was not to be. As Friday is my day off from my day job where I rush round doing all the things I don’t get done during the week, I ended up with very little time and rushed the cake. As a result the second of the two cakes stuck to the tin. Eventually it came out but I was so annoyed. Not only that but I remembered I had no white sugarpaste spare. I normally have a packet or two in the cupboard but I had forgot to replace them. So back to the drawing board I went! In the end my cake did not represent Yorkshire at all but I couldn’t think of anything else to make with the ingredients I had left and the limited time I had. I have enjoyed baking Delia Smith’s Lemon Layer cake in the past and wanted to try out a new version found in her latest edition of her “Cakes” book which included a different topping. This was a whipped cream topping with grated lemon zest on top. 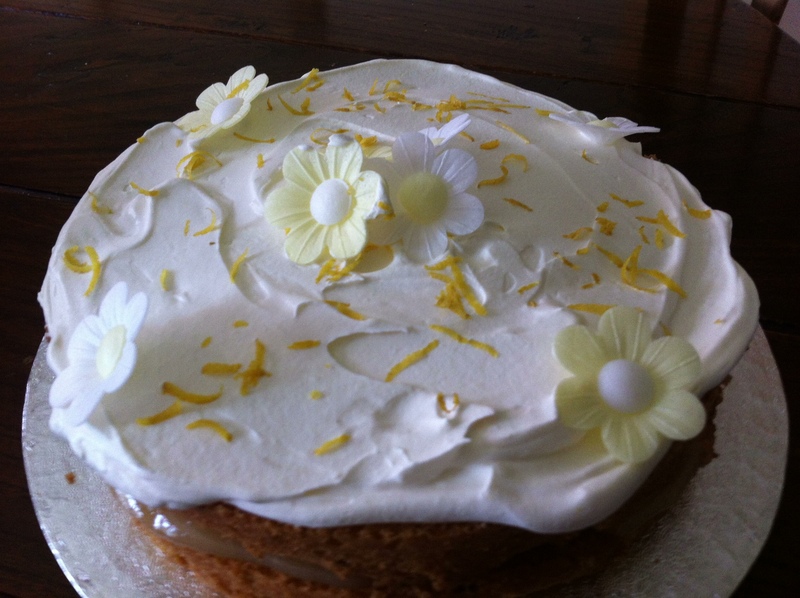 The Lemon Layer cake has Dr Oetker edible wafer daisies on top of it, alongside some shaved lemon zest. The cake itself is a really simple cake to make: a lemon sponge made out of butter, caster sugar, eggs, self raising flour, lemon zest and juice. It was simply mixed together with my hand beater using the all in one method. Delia gives the recipe to make a homemade lemon curd to accompany the cake as a filling. I didn’t have enough lemons to do this but did have a jar of lemon curd in the cupboard. It was a good make bought from a local farm shop so it would be suitable and save time. The cake only took 20-25 minutes to bake in the oven and was soon put on a wire rack to cool. Once cold I removed the two cakes from the sandwich tins. Delia’s recipe suggests cutting the two layers horizontally so you end up with four layers. I didn’t do this and just sandwiched the two cakes together. Finally, I whipped up a small pot of cream and spread it on top of the cake. I didn’t have enough cream to go round the side of the cake. To finish off the decorations I added yellow and white wafer daisies from Dr Oetker and some small lemon zest shavings. 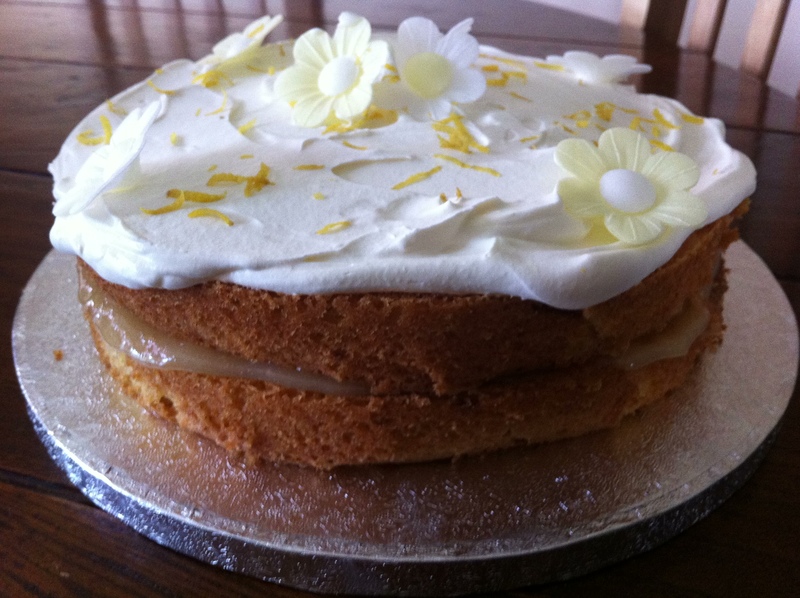 Finished and ready to take for the Clandestine Cake Club event, my version of Delia Smith’s Lemon Layer Cake.